How much do different scoring systems affect fantasy football rankings? Ever start a fantasy football draft and realize that passing touchdowns are worth 6 points, not 4? Or how about realizing at the last minute that the commissioner of your league decided to have a point per reception (PPR) league. We know that this year running backs are going to be going early in the draft. But if your league is a PPR or gives 6 points for a passing touchdown, should you be focusing on quarterbacks and receivers instead? Sounds like a perfect question for a data analysis in a statistical software package like Minitab! My first reaction to this type of league is “HOLY VINCE LOMBARDI, GIVE ME ARRON RODGERS RIGHT NOW!!!!!! !” But when you stop and think about it, every quarterback is benefiting from this scoring upgrade, not just Rodgers. So if they are all scoring more points (remember, QBs already score more points than other positions), will any of them really be more valuable? To test this, I obtained projections for the top 100 players, then compared their projections to the “average” player of the same position. A common way to determine the average player is to use the number of players at each position who are drafted in the top 100. For example, 13 quarterbacks are drafted in the first 100 picks on average. So I took the projection for the 13th pick (Eli Manning) and subtracted it from the projections of every other quarterback in the top 100. After doing this for each position, I was able to have a common value (I called it the “Value Score”) I could rank all the players on. NOTE: This is similar to what I did in my previous blog post. However, instead of using projections from just one site (ESPN), a friendly reader pointed me to fantasypros.com. Their projections are averages of projections obtained from multiple fantasy sports sites (CBS Sports, ESPN, Pro Fantasy Focus, FFToday, and NFL.com). I love the idea of having a much more diverse collection of projections instead of just relying on one site, so I'm getting my data from their site. Now back to the analysis. First, I ranked the top 100 players on their value score using projections that scored passing touchdowns as 4 points. Then I did it again using projections that scored them as 6 points. Now I can compare a player’s ranking before and after the scoring change to see how much they moved in the rankings. To see how the 13 quarterbacks moved as a group, I did a paired t test. We see that the average ranking of quarterbacks when touchdown passes are 4 points is 46.8, and when you change them to 6 points it...well...pretty much stays the same! The average does drop to 48.2, but the difference isn’t statistically significant. So giving quarterbacks more points for passing touchdowns doesn’t change a thing! Well, it’s not quite right. The reason the difference is 0 is because some quarterbacks rankings go up, but others actually go down. That’s right—giving 6 points for a passing touchdown makes some quarterbacks less valuable. Remember that Eli Manning is our “average” player. He’s projected for 28.5 touchdown passes. Now think of the mobile quarterbacks who are ranked ahead of him (Newton, Kaepernick, RG III, Wilson, and even Luck). All 5 of them are projected for fewer touchdown passes than Eli. They are ranked ahead of him because they will get rushing yards and rushing touchdowns that Eli won’t. So when passing touchdowns become more valuable, the gap between Eli and the mobile quarterbacks narrow, making them all less valuable, and thus decreasing their ranking. Below is a list of each quarterback, and how their rankings changed. Unless you’re Rodgers, Brees, Manning, or Brady, the scoring change isn’t helping you at all. And you can see how much it hurts the mobile quarterbacks. 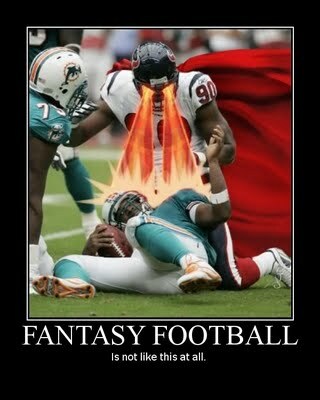 Keep that in mind if your league gives 6 points for a passing touchdown! Now let’s move on to PPR leagues. Is Megatron going to become a top 5 pick now? (Hold on, adding Megatron to my Word dictionary.) I did the exact same thing as before, but this time I gave running backs, tight ends, and wide receivers a point per reception (based on their projected receptions for the season). My rankings also assumed 4 points for a passing touchdown. So let’s get right to the data. I did another paired t test on the wide receivers rankings before and after the PPR rule change. We see that on average a PPR league improves a wide receiver’s rankings by almost a full 5 places, and the difference is statistically significant. Megatron doesn’t become a top 5 pick (his ranking only improves from 11th to 9th), but there are 7 receivers that improved by double digits. Here is a table of those 7 players. So if all those receivers are moving up in the rankings, who is moving down? The answer is: quarterbacks. They become almost an afterthought in PPR, as Aaron Rodgers is the highest ranked QB at #26. On average, each quarterback drops 11.9 spots in the rankings. So make sure not to take a QB early if you're in a PPR league, and focus on the 7 receivers mentioned above! Maybe your league has a unique scoring system. For example, my family league couldn’t agree on whether to have a PPR or not. So we decided to split the difference and make it half a point per reception. If you want to see the rankings on your own league settings, here is a worksheet with the raw data I used in it. It lists the top 100 players with their projected fantasy points (with 4 points for a passing TD and no PPR), projected receptions, and projected touchdown passes. Simply calculate each player's new projection for your league (for my family league, I’ll divide the projected receptions by two and add them to the standard projections). Then find the “average player” at each position (which is the player with the lowest score). Then subtract the new projections from the average player’s score, and sort on that value! And if you’re interested, the worksheet above also has the top 100 players for each of the 3 scoring systems I mentioned in the article. Don’t forget, rankings are more of a guideline than the absolute truth. These projections love Doug Martin, as he’s ranked #2 in each scoring system. But I also did a statistical analysis showing that there are signs that he might not perform as well as he did last year. The projections also don't think too highly of Tom Brady (ranked 39th in a standard league), because he lost 4 of his top 5 targets from last year and the fifth is currently injured. But didn't Brady win a Super Bowl with Troy Brown as his best receiver? I'll believe Tom Brady will struggle when I see it. In fact, I'm of the mind that if you just pushed a shopping cart away from the line of scrimmage each play, Brady could get the shopping cart to average 5 catches and 32 yards a game. So make sure to include your own thoughts about each player when making your pick. And above all else, just have fun with it! After all, it’s only fantasy football.